The name says it all. These sauces are hot and you can definitely feel it. The screaming faces on the bottles come to warn you about the heat that is contained in these sauces. The heat is not the only thing that pops out, the flavor is also worth it. The sting of the hot scorpion is excellently rounded off with a dash of pineapple and a perfectly seasoned mixture of BBQ spices. Hot, spicy and slightly sweet, it goes well with pulled pork, ribs and chicken. BBQ extreme! Delicious - with a fantastic Carolina Reaper punch. Tastefully smoky chilli blend, orange and neat spiciness for a unique, complex taste. The sauce for garlic fans who like it hot as well! Salsa composed of a perfect mixture of sweet tomatoes, roasted Jalapaños, coriander and a splash of lime. Now NEW at Pepperworld: Hot, Sweet and Spicy - Perfect to enjoy (relish) or as a topper for hotdogs, sandwiches and burgers. Pain 100% is the hottest of the three pain sauces. 100% Habanero, 100% Pain and 100% Natural (Yummy). Slightly sour with a subtle Essignote. Otherwise nothing for the absolute purity in the taste. On to Jamaica! Habanero, pineapple and Caribbean spices provide heat and flavor. Pain 95% is the next step up the sharpening scale. Nice strong and slightly sweet grill companion for meat in all variations. Now NEW at Pepperworld: Spicy, spicy BBQ sauce with Ghost Pepper (Bhut Jolokia) - Very tasty with beef breast, ribs and poultry meat. The classic and also suitable for sharp beginners: Smoked Chipottle chillies (over pecan wood smoked jalapenos) and strong herbs give all body dishes the perfect aromatic-smoky note. Typical Sriracha sauce with absolutely unexpected finish. Carolina Reaper makes her grand entrance, rocks the sauce and burns it down. This makes every dish a fiery ballet of taste. Now NEW at Pepperworld: Jalapeno Pepper Sauce - Whether eggs, chicken or steak - this sauce fits perfectly with everything. Now NEW at Pepperworld: There's a moment where pleasure and pain intersect - addictive. NEW at Pepperworld: Delicious salsa with smoked jalapenos (Chipotle). NEW at Pepperworld: Fire roasted jalapeno sauce. For real (Chicken-)Wings-Lover! Nice 'Cheesy and hot! And who makes the fiery sauces? The manufacturer founded his company in 1999 with the specialization on small batch sizes to develop the full flavors as gently as possible. He quickly developed a reputation for creating delicious and unique specialties. The brand Pain is Good stands for the very special hot sauce, which is really spicy and provided with the full force of chillies. Meanwhile, the Kansas based company has received over 200 national and international awards and honors for its products. And the chilies? Only the very hard ones come out of the garden and into these sauces! Chili Hot Sauce extreme for those who love the line between pain and pleasure. Pure or Dilute, the name is program and adds spicy fire to all dishes. Stop the kids stuff, start with thrifty drops and slowly approach the threshold of pain drop by drop. Because the Pain is Good Sauces from Original Juan Hot Sauce makes your taste buds shake and smoke your throat. A real adrenaline kick in soups and sauces with a fine sour and animating aroma. 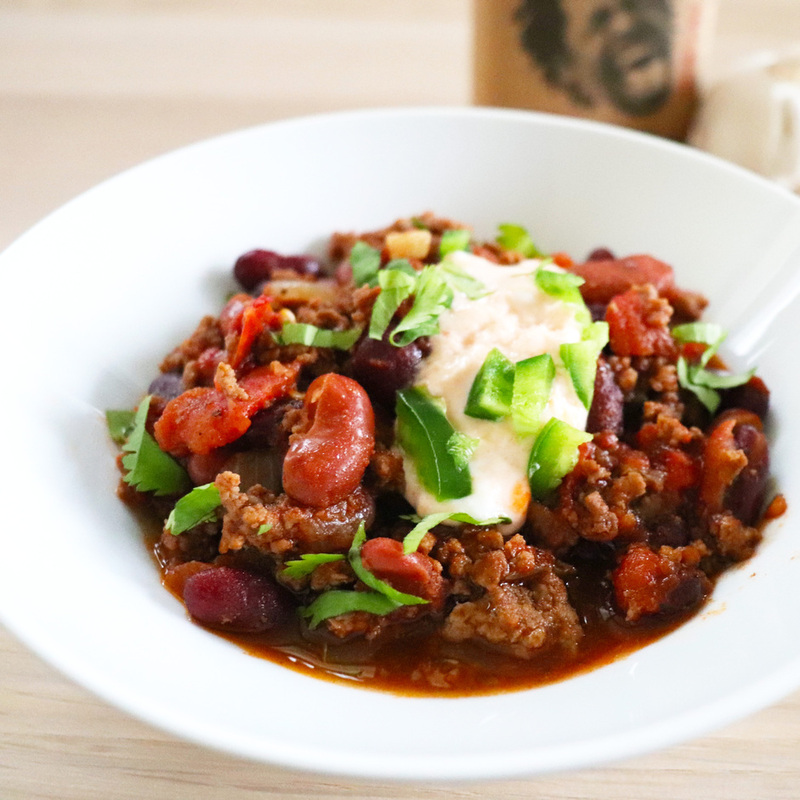 The taste in the favorite dish Chili con Carne is particularly full-bodied. Just add a few drops and enjoy a really good chili! Cook the minced meat, onions and garlic over medium heat in a 5 liter saucepan. Cook for 8-10 minutes and stir occasionally. Add chilli powder, spicy sauce (Hehe .. ;-)), ground cumin, salt and pepper. Bring everything to a boil, then reduce the heat until it's simmering and add the beans. Stir occasionally and cook uncovered for 20-30 minutes until the desired thickness is achieved.